For the readers who follow this blog, please visit the official website of the Washington, Idaho and Montana Railway History Preservation Group at http://www.wimryhpg.com/ for more information on the group and its activities. The HPG is involved in a variety of pursuits to keep the local railroad history alive. Please consider becoming a member as a means of adding your support. With everyone pulling together, the depot will be a hub of community and economic development and an encouragement to area historic preservation efforts. Memberships start at $30 and include the always informative White Pine Quarterly, plus merchandise discounts. Also mark your calendars for July 10, 2010 when the speeders return to Potlatch! The progress at the depot almost causes a case of whiplash, it's moving so fast. Pictured above is John French, our faithful carpenter from Deary, who repaired some of the sections of flooring in the waiting room and ticket office. Meanwhile, Shane continues to get the electricity in and Brian, Jim, Aaron, Don and Jack have all done stints on interior improvements. Karen Rohn and Julie Kerr have been amazing and yesterday tackled cleaning the walls in preparation for painting. John's dad Webb will be working further on the plumbing and who knows who else will show up to help. We value the can-do attitude of everyone who takes a turn with the project. Happy St. Patrick's Day, Mr. Deary! The old Irishman William Deary would've been proud. As a co-founder of Potlatch, Idaho, he was one of the first occupants of the Potlatch depot, designed as the first headquarters for Potlatch Lumber Company in 1906. Today, the depot was again alive with activity. Interior work and supportive infrastructure activities were in full swing with both volunteers and contractors pitching in. It was a smiling bunch this St. Patrick's Day (was there some Guinness stashed away in the freight room?). Pictured from the top are: Shane Bartlett, our faithful electrician and model train nut; HPG board member Jim West (in plaid) pondering floor options with hardwood floor specialist Jesse Glassman; Karen Rohn, artist, future tenant and very capable carpenter; HPG board member Brian Magelky and son Aaron, in the fashionable hardhat; Julie Kerr, businesswoman, future tenant and top-notch caulker; Doug Wasankari, earth mover and historic preservationist. Thanks one and all. Things are looking good. 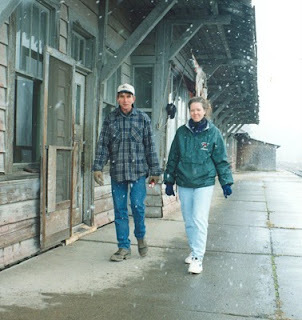 As the crew of volunteers and professionals hammers away on the Potlatch depot interiors this week, it's fun to look back a dozen years. Pictured above are Scott Kammeyer, then mayor of Potlatch, and Cindy Braun, then in charge of the gifted and talented class at Potlatch Elementary School. These two joined a number of others as they toured the rundown depot to see what might be done to rescue the town's first commercial building before it was lost forever. The route to restoration was not an easy one and backers of depot restoration were publically criticized. Cindy's class delved into depot history and the kids got excited about the railroad. And Scott put out a call to write some grants. Today those early-day dreams are being realized as the depot interiors are being upgraded. Look for pictures of a new bathroom, a freshly painted waiting room and other improvements. Dreams are coming true! Things Are Happening at the Depot! Picture if you will a finished interior at the Potlatch depot. 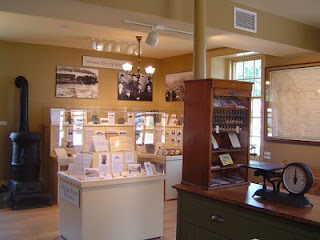 Tom Burg sent along a sample of how a finished space can look (the recently restored Mineral Point depot in Wisconsin). Meanwhile, the bottom photo shows Brian Magelky, left, and Jim West, right, getting started on the downstairs, north end. plumbing, local electician Shane Bartlett is doing the electrical, Karen Rohn is ripping and tearing up floors, Don Somers is patching walls, Tom Cummings pitched in to take out old pipes, and Jack Coyner is carting off the building debris. Brian and Jim are the steady carpenters and during spring break, Brian's son Aaron is also involved. This is a team effort all the way and things are moving fast. Tune in to the blog to see some later shots including the recently exposed brick wall around the downstairs vault. Beautiful!!!! There will likely be competition for who gets this office space.